America is slowly committing suicide. Contrary to popular wisdom, the most serious threat to America does not spring from overseas adversaries. Because the threat is from within, it is much more subtle and ignored. Our self-evident truths have become neither. Our history and First Principles have been cast aside and denigrated by the public, educators, mainstream media, legal profession, and politicians. This state of affairs imperils our very survival; and these are self-inflicted wounds – the very definition of suicide. Let there be no mistake – we may be fighting a hot war against militant Islamic terrorists today, but there is also a cold war raging, right here and right now for the hearts and minds of our citizens – and we are losing. The terrorists have reminded us that some things are worth dying for. The rule of law, equality, the Social Compact, unalienable rights, and limited government are such things. The terrorists, and all enemies of freedom, will win if we simply forget, or reject, what we are and the principles for which we stand. Political amnesia will be our death knell. 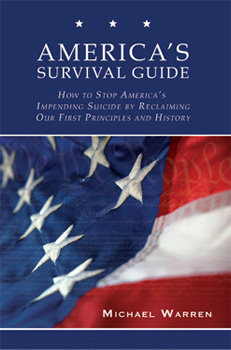 America’s Survival Guide, How to Stop America’s Impending Suicide by Reclaiming Our First Principles and History is a “one stop, full-service” primer to raise the alarm about the impending suicide of America and to help stop it. Click here to read free excerpts. The challenges we face by surveying the overwhelming evidence of our ignorance and disdain of American history and First Principles as it affects: our K-12 system, higher education, the general public, media, and political class. How the First Principles formed the philosophical basis of the Founding Fathers, including George Washington, John Adams, Thomas Jefferson, James Madison, Alexander Hamilton , John Jay, Thomas Paine, Patrick Henry, Benjamin Franklin, John Dickinson, James Wilson, Joseph Warren, and Benjamin Rush. And how John Locke, Thomas Hobbes, and Montesquieu contributed to the understanding of the Founding Fathers. How the First Principles were the underlying cause of the American Revolution and became the foundation for our Federal Constitution. How the First Principles formed the basis of the struggle for racial and gender equality, including the efforts of Frederick Douglass, Abraham Lincoln, Reconstruction and the Radical Republican Congress, Martin Luther King,Jr., Abigail Adams, Sarah Grimke, Susan B. Anthony , and Elizabeth Cady Stanton. Specific recommendations to combat the threat, including education, legal, media, holiday, nonprofit, and political reform. These innovative approaches include adopting an American Freedom Curriculum, reforming teacher preparation institutions, revising the bar exam, reorientating the media, and changing the political discourse. Together, the sections of America’s Survival Guide provide what we need to stop us from drinking our collective hemlock. "America's Survival Guide is a bold and insightful work that should be taken seriously by those concerned with the future of America. We ignore it at our peril." "America's Survival Guide describes with detail and passion the dangers that come from abandoning the "First Principles" upon which this nation was founded. But this important book offers more than a diagnosis and despair, it presents a reasoned program for restoring the U.S. Constitution its proper place at the center of American society and government. The book draws on history, politics and education to make a powerful case for freedom and fighting for it."